The CD98 (4F2, FRP-1) is a widely expressed cell surface protein heterodimer composed of a glycosylated heavy chain and a non-glycosylated light chain. Originally described as a T cell activation antigen, it was later shown to function in amino acid transport, cell fusion and homotypic cell aggregation. Several lines of evidence suggest its functional interaction with integrins but the biochemical basis for this interaction has been unclear. We demonstrate that CD98 constitutively and specifically associates with β1 integrins (α2β1,α3β1, α5β1 and α6β1), but minimally with α4β1. 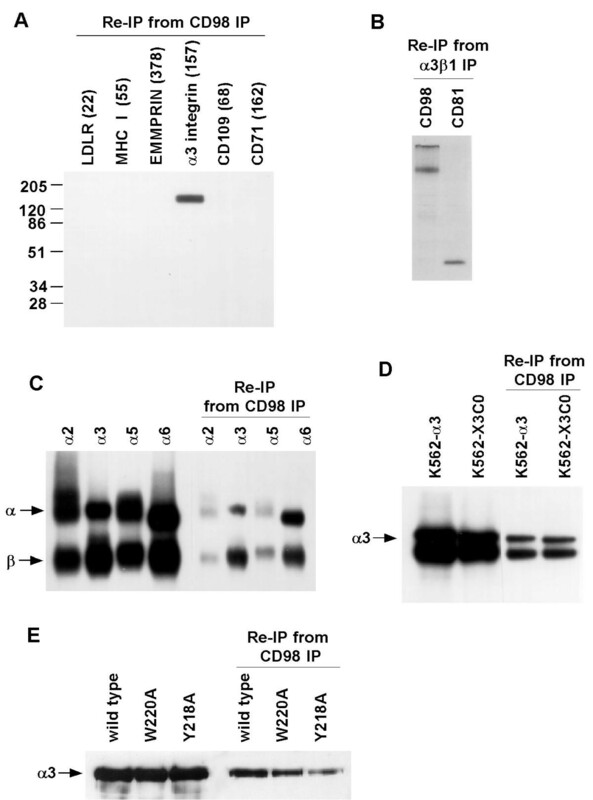 Integrin-CD98 association was established by reciprocal immunoprecipitation experiments, and confirmed by CD98-induced clustering of α3β1 but not α4β1 on the surface of rhabdomyosarcoma cells. Integrin-CD98 association is independent of the α subunit cytoplasmic tail, is maintained in α3β1 ligand-interaction deficient mutants, and is not inhibited by EDTA. Within the CD98 heavy chain, a C109S mutation (but not a C330S mutation) caused a loss of β1 integrin association. The same C109S mutation also caused a loss of CD98 light chain association. Importantly, CD98 associated selectively with β1 integrins present in low density "light membrane" fractions on a sucrose gradient. CD98 was not present in dense fractions that contained the majority of β1 integrins. Notably, the C109S mutant of CD98, that did not associate with β1 integrins, showed also a reduced localization into light membrane fractions. We demonstrate that CD98 association with β1 integrins is specific, occurs in the context of low density membranes, and may require the CD98 light chain. The CD98 (4F2, FRP-1) molecule, a cell surface disulfide-linked heterodimer, was originally described as a T cell activation antigen , and later was shown to provide a co-stimulatory signal for CD3-mediated T-cell activation , independent of CD28/CD80/CD86 interaction . In other studies, triggering of human monocyte CD98 could suppress T cell proliferation , or promote homotypic cell aggregation of monocytes . Also, CD98 may be a target antigen for natural killer cells , may mediate fusion of blood monocytes leading to osteoclast formation [7, 8], and may modulate hematopoietic cell survival and differentiation . The CD98 molecule is also widely expressed on rapidly growing non-hematopoietic cells, where it may modulate oncogenic transformation [10, 11], metal ion transport [12, 13], cell fusion [14, 15], and amino acid transport [16–19]. CD98 is also expressed on normal proliferating tissue such as the basal layer of squamous epithelia  and on cells having secretion or transport functions . Understanding of the role of CD98 in amino acid transport has been greatly enhanced with the recent cloning and characterization of multiple CD98 light chains. Distinct CD98 light chains appear to mediate distinct amino acid transport activities (for review see [22, 23]). Several lines of evidence now suggest that CD98 may modulate the functions of integrins. For example, CD98 and β1 integrins may act together during T-cell co-stimulation . A genetic screen revealed that CD98 may indirectly influence integrin affinity for ligand . Also, anti-CD98 mAb appeared to modulate integrin-dependent adhesion in two separate studies [25, 26]. In addition, antibodies to both CD98 and α3β1 integrin promoted cell fusion , and antibodies to β1 and β2 integrins blocked monocyte cell-cell fusion and aggregation functions induced by an anti-CD98 mAb . Finally, like CD98, the α3β1 integrin has been implicated in amino acid transport . The biochemical mechanism by which CD98 and integrins functionally interact remains unclear. The CD98 molecule associates specifically with immobilized β1 integrin cytoplasmic tail fusion proteins under very mild detergent conditions (0.05% Triton X-100) , but CD98 has not yet been shown to interact physically with intact β1 integrins. We began the present study by searching for integrin-associated proteins in an unbiased manner (i.e. we were not specifically looking for CD98). We utilized a monoclonal antibody screening method involving co-immunoprecipitation of integrins under non-stringent detergent conditions [30, 31]. Using this approach, we have previously discovered specific associations between particular β1 integrins and other cell surface molecules including CD147/EMMPRIN , and various tetraspanin (transmembrane-4 superfamily) proteins [30, 32, 33]. In this report we demonstrate for the first time that CD98 constitutively and specifically associates with intact β1 integrin heterodimers. Specific CD98-integrin interaction occurs in the context of low density protein-lipid microdomains, possibly resembling lipid rafts [34, 35]. Several important signaling molecules, including activated TCR, LAT and LCK are present in organized raft-type microdomains, and integrity of these microdomains is necessary for T cell receptor signal transduction [36, 37]. Our present discovery that β1 integrins specifically associate with CD98 in lipid microdomains helps to explain the functional connections between β1 integrins and CD98 during T cell costimulation, monocyte fusion, and elsewhere. Mice were immunized with MTSV1-7 human mammary epithelial cells, and approximately 600 hybridomas were generated. Upon monoclonal antibody screening, 16 were identified that co-immunoprecipitated integrins without recognizing integrins directly. Of these, one recognized CD63 as reported previously , and three (including mAb 6B12) recognized a disulfide-linked cell surface heterodimer consisting of an 85 kD heavy chain and a 35 kD light chain. From I125 surface-labeled HT1080 cells, mAb 6B12 immunoprecipitated a heterodimer of 85 and 35 kD under reducing conditions (Fig. 1, lane a, solid arrows) and a single protein band of 120 kD under non-reducing conditions (not shown) but no other protein bands when lysates were prepared in 1% Triton XI 00 detergent. However, in the less stringent Brij 58 detergent, mAb 6B12 co-immunoprecipitated an integrin-like protein band of 130 kD (Fig. 1, lane b, dotted arrow). Similar results were noted when CHAPS or Brij 99 detergents were used (not shown). Characterization of mAb 6B12. A. HT1080 cells were surface labeled with 125I, lysed in the indicated detergents (each at 1%), and then proteins were immunoprecipitated using mAb 6B12 (lanes a,b). Also, 125I-labeled Molt4 cells were lysed in 1% Triton XI 00, and labeled proteins were precipitated using mAb 6B12 (lane c), 4F2 (lane d), or anti-mAb A2-2E10 (lane e). Proteins were resolved on 10% SDS-PAGE under reduced conditions. B. Chinese hamster ovary cells transfected with CD98 cDNA (solid line), with β1 integrin cDNA (close dotted line), or mock transfected (dotted line) were each stained with mAb 6B12. Following FITC-labeled goat anti-mouse second antibody staining, flow cytometry was carried out using a FACScan Instrument (Becton Dickinson, Mountainview, CA) as previously described . Because the proteins recognized by 6B12 resembled the disulfide-linked 85 and 35 kD subunits of CD98 [38, 39], they were compared to authentic CD98 as precipitated using mAb 4F2. 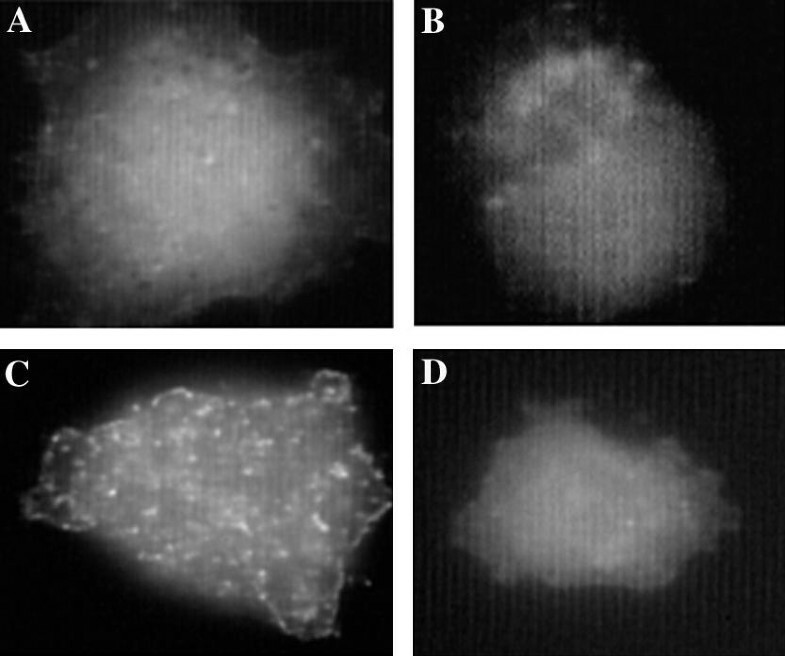 Both mAb 4F2 and mAb 6B12 precipitated identical patterns of cell surface proteins, as seen by reduced SDS-PAGE (Fig. 1A, lanes c,d). Furthermore, preincubation of cell lysates with mAb 4F2 resulted in loss of the antigen recognized by mAb 6B12 (not shown). Upon addition of 10 mM DTT to cell lysates, mAb 6B12 immunoprecipitated only a 85 kD protein band, consistent with specific recognition of the CD98 heavy chain. Flow cytometry of CHO cells transfected with CD98 heavy chain cDNA confirmed that the CD98 heavy chain is the 6B12 antigen (Fig. 1B). Also, by flow cytometry the 6B12 antigen was present at high levels on all human cell lines tested (more than 20) as expected for CD98. To identify the integrin-like 130 kD protein(s) co-precipitating with CD98, immune complexes prepared from HT1080 cells were dissociated and reprecipitated with mAb against various cell surface molecules. From CD98 immunoprecipitates we recovered α3β1 integrin, but not other cell surface molecules, including the LDL receptor, HLA class I, the metalloprotease regulator EMMPRIN (CD 147), CD71, or CD 109 (Fig. 2A). Several other β1 integrins that are abundant on HT1080 cells (α3β1, α2β1, α5β1, and α6β1) also could be re-precipitated from CD98 immunoprecipitates (Fig. 2C). Using the same experimental conditions, we were unable to detect α4β1 in CD98 immunoprecitates prepared from the rhabdomyosarcoma cell line RD, the lymphoblastoid cell line Molt4, or K562 cells transfected with α4 integrin (not shown). However, we did observe co-immunoprecipitation of CD98 with α4β1 integrin in the presence of 2 mM manganese (not shown). The precise role of manganese is unclear. Incubation with anti-β1 'activating antibody' TS2/16 (not shown) did not mimic the effects of manganese on α4β1-CD98 association. Thus, although manganese is well known to "activate" β1 integrins , this activation may not be relevant to α4β1-CD98 association. Comparison of material isolated from CD98 immunoprecipitates with total amounts of each integrin on the cell surface indicates that approximately 5–10% of each integrin is associated with CD98 (Fig. 2C, compare lanes a-d with e-h). 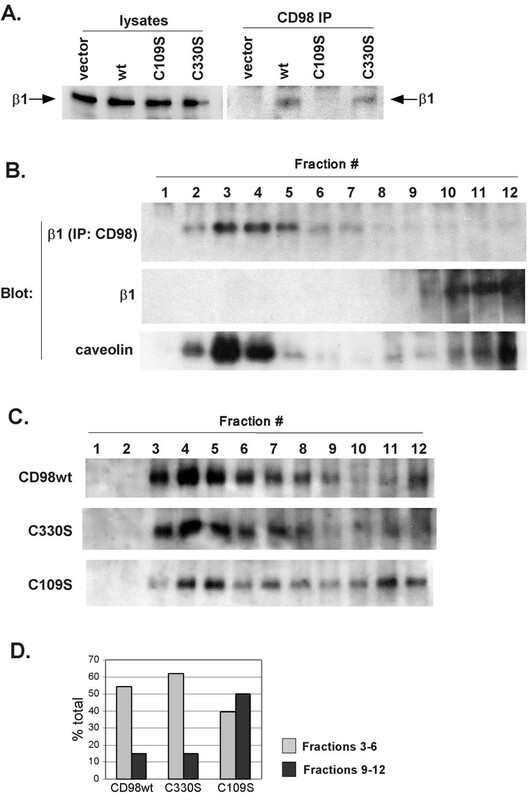 In a reciprocal experiment, CD98 heavy chain was re-precipitated from an α3β1 integrin immunoprecipitate (Fig. 2B, lane a) at a level comparable to re-precipitated CD81 (lane b), a molecule shown previously to associate with α3β1 integrins . Results in Fig. 2A and 2B indicate that CD98-integrin complexes are distinct from previously described integrin-CD81 [32, 40] and integrin-CD147/EMMPRIN  complexes. Selective co-precipitation of integrins with CD98. A. HT1080 cells were surface labeled with 125I, lysed in 1% Brij 58, then immunoprecipitated with anti-CD98 mAb 6B12. The CD98 immunoprecipitate was then dissociated using 1% Triton X-100 and reprecipitated with mAb to the indicated proteins. Numbers in parentheses above each lane indicate the mean fluorescence intensity of each cell surface antigen as determined by flow cytometry analysis. B. HT1080 cells were labeled overnight with 35S methionine, lysed in 1% Brij 58 then immunoprecipitated with mAb A3-IIF5. Immune complexes were dissociated using 1% Triton X100 and re-precipitated using anti-CD98 mAb 6B12 or anti-CD81 mAb M38. C. Lysates prepared as in Part A were analyzed by immunoprecipitation using mAbs A2-2E10, A3-IIF5, A5-PUJ2, and A6-BB respectively (left 4 lanes). Immunoprecipitation with mAb 6B12 was followed by elution with 1% Triton X100 and reprecipitation with A2-2E10, A3-IIF5, A5-PUJ2, and A6-BB mAb respectively (right 4 lanes). D. Cells transfected with wild type α3 or α3 integrin lacking a cytoplasmic tail (X3C0), were surface-labeled with 125I and lysed in 1% Brij 58. Lysates were immunoprecipitated with anti-α3 mAb A3-IIF5 (left 2 lanes) or first immunoprecipitated with mAb 6B12 then subjected to reprecipitation with mAb A3-IIF5 (right 2 lanes). E. Cells transfected with wild type α3 (lane a) or mutant α3 (W220A or Y218A) were cell surface biotinylated and lysed in 1% Brij 58. Lysates were immunoprecipitated with anti-α3 mAb A3-IIF5 (left 3 lanes) or first immunoprecipitated with mAb 4F2 and then subjected to reprecipitation with mAb A3-IIF5 (right 3 lanes). Because not all β1 integrins associated constitutively with CD98 (in the absence of manganese), the α chain must help regulate specificity of CD98 association. Notably, α3 with a truncated cytoplasmic tail, and wild-type α3 associated equally well with CD98 (Fig. 2D, lanes c,d). Thus, specificity for constitutive association with CD98 may reside in integrin α chain extracellular or transmembrane domains. To check whether CD98 is a ligand for α3β1 integrin, we used K562 cells transfected with wild type α3, or α3 mutants deficient in adhesion to α3 ligands laminin 5 (W220A) and invasin (Y218A) . All of these α3 proteins constructs associated with CD98 (Fig. 2E). Notably, 2 mM EDTA had no inhibitory effect on constitutive integrin-CD98 associations (not shown). Thus, CD98 itself does not appear to be acting as an integrin ligand. We were unable to demonstrate any changes in the adhesive functions of CHO cells upon CD98-transfection. However, functional effects of transfected human CD98 could be overshadowed by an excess of endogenous hamster CD98. Next we asked whether clustering of CD98 would induce selective clustering of β1 integrins. On the surface of RD-A3 cells, CD98 was clustered by incubation with anti-CD98 mAb 4F2, followed by incubation with rabbit anti-mouse antibody. Subsequent incubation with anti-α3 mAb directly conjugated to Alexa-488 revealed that α3β1 was highly clustered (Fig. 3C), unless pre-clustering of CD98 was omitted (Fig. 3A). In contrast, staining with anti-α4-Alexa-488 mAb revealed a diffuse pattern of staining, regardless of CD98 clustering (Fig. 3B, 3D). If no Alexa-488-conjugated antibodies were added, no staining was observed (not shown). Immunofluorescent staining of both α3β1 and CD98 showed that they were distributed similarly on the cell surface of HT1080 and RD-A3 cells and partially co-localized (not shown). Integrin clustering induced by CD98 cross-linking. RD A3 cells were grown on coverslips coated with fibronectin (20 μg/ml) for 48 hours. Cells were blocked with 20% goat serum and in some cases incubated with anti-CD98 mAb 4F2 (10 μg/ml) (C,D). Next, cells were washed, blocked with 20% goat serum and incubated with rabbit anti-mouse Ab (5 μg/ml). Finally, cells were fixed for 15 minutes with 2% paraformaldehyde, blocked with 20% goat serum and incubated with anti-α3 mAb A3X8 PUJ1 (10 μg/ml) (A, C) or anti-α4 mAb A4-PUJ1 (10 μg/ml) (B, D), each directly coupled with Alexa-488 (Molecular Probes). Coverslips were mounted with ProLong AntiFade Kit (Molecular Probes) and immunofluorescence examined using a Zeiss Axioscop equipped with optics for epifluorescence. The CD98 heavy chain contains two extracellular cysteines. Each of these cysteines was mutated to serine, and the effects on β1 integrin association were evaluated. Stably expressed human CD98 heavy chain C330S mutant retained association with endogenous murine β1 in NIH 3T3 cells, comparable to that seen for wild type CD98 heavy chain. However, the C109S mutant showed no detectable β1 association (Fig. 4A, right panel). Murine β1 (Fig. 4A, left panel), and mutant and wild type forms of CD98 (see legend) were expressed at comparable levels in each of the transfectants. Notably, association of CD98 heavy chain with CD98 light chain was maintained for the C330S mutant, but was lost for the C109S mutant (not shown), in agreement with previously published results suggesting that Cysteine 109 is required for disulfide linkage to the light chain . These results suggest that the CD98 light chain might be necessary for CD98-integrin association. One possibility is that the light chain is more proximal to the integrin. When suitable anti-light chain reagents become available, this could be directly tested in covalent crosslinking experiments. In this regard, we have thus far been unable to crosslink CD98 heavy chain directly to β1 integrin, using either membrane-permeable or membrane-impermeable crosslinkers (not shown). Correlation between CD98-integrin association and CD98 heavy chain-light chain dimerization. A. NIH 3T3 cells (107 cells/experiment) expressing wild type human CD98 heavy chain, CD98 heavy chain mutants (C109S or C330S) or control NIH 3T3 cells were lysed in 1% Brij 58 and then proteins were immunoprecipitated using 4F2 mAb. Cell lysates (left 4 lanes) and immunoprecipitates (right 4 lanes) were resolved in 8% SDS-PAGE, transferred to nitrocellulose membrane, probed with biotinylated KMI6 mAb (anti-mouse β1 integrin) followed by incubation with ExtrAvidin-HRP (Sigma) and developed using Renaissance Chemiluminescence Reagent (NEN Life Science Products, Boston, MA). B. HT1080 cells (107 cells/experiment) were lysed in sodium carbonate buffer, pH 11 and fractionated in isopycnic discontinuous sucrose gradient as described in Materials and Methods. 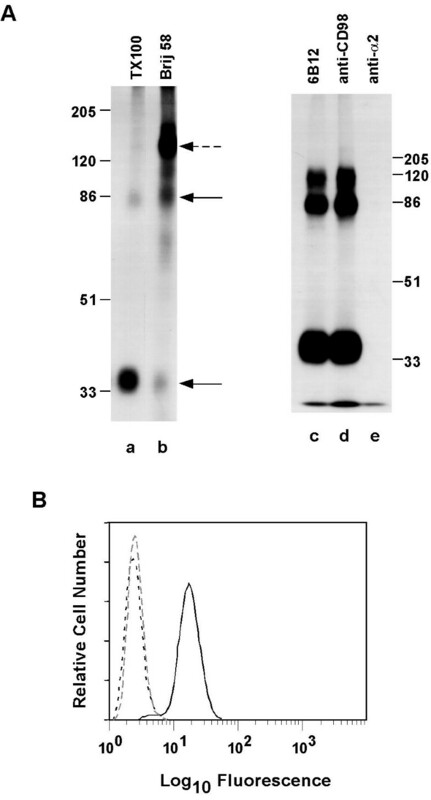 Fractions were analyzed by SDS-PAGE electrophoresis followed by Western blot analysis using biotinylated TS2/16 mAb or polyclonal anti-caveolin antibody, or adjusted to pH 7.5 and immunoprecipitated with 4F2 mAb and then blotted with biotinylated TS2/16 mAb. C. NIH 3T3 cells (107 cells/experiment) expressing wild type human CD98 heavy chain, or mutant CD98 heavy chains (C109S or C330S) were cell surface biotinylated, lysed in sodium carbonate buffer, pH 11 and fractionated in sucrose gradients as described in Materials and Methods. Fractions were adjusted to pH 7.5 and immunoprecipitated using 4F2 mAb. Immunoprecipitated proteins were separated in 8% SDS-PAGE under non-reducing conditions and blotted onto nitrocellulose membrane. Blots were developed using ExtrAvidin-HRP (Sigma) and Renaissance Chemiluminescence Reagent (NEN Life Science Products, Boston, MA). For NIH3T3 cells, flow cytometry was used to demonstrate comparable levels of wild type CD98 (MFI = 27), C109S (MFI = 30), and C330S (MFI = 53) expression. Cells were 100% positive, with homogeneous peaks, well above background staining (MFI = 1). MFI=Mean Fluorescence Intensity. D. Relative distribution of CD98 wild type and C109S and C330S mutants in light (fractions 3–6) and dense (fractions 9–12) fractions from the Western blots shown in Fig. 4C. Densitometry was carried out using GeneGenius Bio Imaging System and analysis software, (Syngene, Frederick, MD). A typical experiment out of three performed is shown. Another possibility is that the CD98 light chain may target the CD98 heterodimer to the specific membrane domain where interactions with β1 integrins may be localized. To test the latter hypothesis, we compared the total β1 integrin distribution with the distribution of the fraction of β1 integrins complexed with CD98 on HT 1080 cells (Fig. 4B). Although β1 integrins were predominantly present in the dense membrane fraction on a sucrose gradient, the subset of β1 integrins complexed with CD98 was localized to the 'light' membrane fractions. These fractions typically contain caveolae and 'membrane rafts' thought to be enriched in active signaling complexes [34, 35, 43]. The fraction of the β1 integrins detected in the light membrane fractions represents no more than 5% of total β1 integrins (based on the densitometric analysis, not shown). Though caveolin is present in the same fractions as CD98-integrin complexes, it does not co-immunoprecipitate with CD98 under these conditions (not shown) and thus is not part of integrin-CD98 complexes. Similarly, GPI-linked proteins such as CD 109, TM4SF proteins such as CD81, and other transmembrane proteins such as CD147/EMMPRIN can be found at substantial levels in light membrane fractions [44, 45], and our unpublished results), and these also did not co-immunoprecipitate with CD98 (Fig. 2A, 2B). Thus, CD98 association with integrin has another level of specificity beyond simply co-localizing in light membrane fractions. Finally, to see whether the CD98 light chain might help to target the CD98 heavy chain to the light membrane fractions, we looked at the distribution of the wild type CD98 and CD98 mutants in the sucrose gradients (Fig. 4C,D). The majority of wild type CD98 heavy chain and control mutant (C330S) are localized to the light membrane fraction (55–60%, Fig. 4D), whereas the C109S mutant is partially shifted to the dense fractions (40% in the light fraction, 50% in the dense fractions, Fig. 4D). These results are consistent with the CD98 light chain targeting the CD98 heavy chain to light membrane fractions. It is perhaps not surprising to observe ~40% of the C109S heavy chain mutant remaining in the light membrane fraction (Fig. 4C,D), considering that the CD98 heterodimer retains partial association and amino acid transport function even in the absence of a disulfide linkage of the subunits . Notably, transformation of BALB 3T3 cells caused by over-expression of CD98 heavy chain required its association with the light chain, and a missense mutation in C109 eliminated its transforming activity . The CD98 protein was recently shown to associate specifically with integrin β chain cytoplasmic tail fusion proteins  in 0.05% Triton X-100 detergent conditions. One may speculate that the use of 0.05% Triton X-100 may have allowed maintenance of CD98 microdomains, needed for β1 interaction. In this regard, in 0.05% Triton X-100 lysates, many transmembrane proteins remain in the light membrane fractions of a sucrose gradient [46, 47]. Although the role of the CD98 light chain was not addressed in the earlier study , we assume that it may have played a key role. Furthermore, CD98 interaction with recombinant β chain cytoplasmic tail fusion proteins, in the absence of the α chain , is consistent with our observation that the α chain cytoplasmic tail is not needed for integrin-CD98 association. On the other hand, we observed CD98 interaction with several β1 integrins, but not α4β1. Thus for intact integrins in the context of mammalian cells, the integrin β chain apparently does contribute to the specificity of CD98 interaction. The α chain might provide a level of specificity by changing the conformation of the β chain and/or by providing an additional site of interaction with the CD98 light or heavy chains. Because our integrin-CD98 complex was observed in light membrane fractions and not in dense sucrose gradient fractions, and because we could not capture the complex by covalent crosslinking (not shown), the interaction may not be direct. Nonetheless, an abundance of evidence points to the functional relevance of this complex (references above). Furthermore, integrin αVβ3-CD47 complexes have considerable functional relevance, despite being found only under relatively mild detergent conditions (e.g. Brij 58) and exclusively in the light membrane fractions of a sucrose gradient [48, 49]. In summary, we show a highly specific biochemical link between intact β1 integrins and CD98, as demonstrated by reciprocal co-immunoprecipitation and co-clustering experiments. Furthermore, CD98 association with β1 integrins appears to occur in the context of an ordered lipid microdomain (as evidenced by co-localization in light membrane fractions of sucrose density gradients), and appears to require the light chain of CD98. These results may help to explain recent reports that CD98 may modulate integrin ligand binding, adhesion, signaling, T cell co-stimulation and cell fusion functions. Monoclonal antibodies used in this study are: 4F2, anti-CD98 heavy chain , A2-2E10, anti-α2 integrin ; A3-IIF5, anti-α3 integrin ; A5-PUJ2, anti-α5 integrin ; B5G10, anti-α4 integrin ; A4-PUJ1, anti-α4 integrin ; A6-BB, anti-α6 integrin ; TS2/16, anti-β1 integrin; W6/32, anti-HLA class I ; C7, anti-LDL receptor ; 5E9, anti-CD71 ; IIIC4, anti-CD 109 ; 8G6, anti-CD147/EMMPRIN ; and KMI6, anti-mouse β1 integrin (Pharmingen, San Diego, CA). The mAb P3  was used in all immunoprecipitation and flow cytometry experiments as a negative control. Human cell lines used in this study were the fibrosarcoma cell line HT1080; rhabdomyosarcoma cell line RD stably transfected with human α3 integrin (RD A3); lymphoblastoid T cell line Molt4, human mammary epithelial cell line MTSV 1–7; erythroleukemia K562 cells and φ nx-Eco packaging cells. K562 cells expressing integrin α4, α3, or α3 integrin subunit lacking a cytoplasmic tail (K562-X3C0) were described elsewhere [30, 40]. Also utilized were K562 cells expressing α3 D154A, W220A and Y218A mutants , and Chinese hamster ovary (CHO) cells that express human α2, α3, α5 or β1 integrin subunits [30, 32]. The cDNA encoding human CD98 heavy chain  was provided by Jeffrey Leiden (University of Chicago) in the pUC18 vector. CD98 heavy chain mutants (C109S and C330S) were made by recombinant PCR technique  with the following primers: C109Ss – 5'-CGAGCGCCGCGTTCTCGCGAGCTACCGGCG-3'; C109Sas-5'-CGCCGGTAGCTCGCGAGAACGCGGCGCTCG-3'; C330Ss – 5'-GGCAATCGCTGGTCCAGCTGGAGTTTGTCTCAGGC-3';C330Sas – 5'-GCCTGAGACAAACTCCAGCTGGACCAGCGATTGCC-3'. CD98 heavy chain constructs were subcloned into pLXIZ retroviral vector (Clontech). Transient transfection of φ nx-Eco cells and retroviral infection of NIH 3T3 cells was performed as described . Stable NIH 3T3 infectants were selected in growth medium containing 1 mg/ml zeocin. For immunoprecipitations, labeled cellular proteins were extracted with lysis buffer (1% of the indicated detergent, 20 mM Hepes, pH 7.4, 150 mM NaCl, 2 mM PMSF, 10 μg/ml leupeptin, 10 μg/ml aprotinin, 2 mM MgCl2, 0.5 mM CaCl2) for 60 minutes at 4°C. After preincubation with protein A-sepharose 4CL, the cell extract was incubated with specific mAb directly conjugated to sepharose 4B for 60 min, washed 3 times with the appropriate lysis buffer and eluted with Laemmli sample buffer. In some experiments manganese chloride (2 mM) was added both to cells (10 minutes prior to lysis) and to the lysis buffer. For re-immunoprecipitation experiments, associated proteins were eluted from immune complexes in 1% Triton X100 in PBS, then pre-incubated with protein A-sepharose-4CL. Remaining proteins were then re-precipitated from the eluate using mAb directly conjugated to sepharose 4B beads for 30 min at 4°C, washed three times with 1% Triton X100 in PBS, eluted with Laemmli sample buffer, and resolved on SDS-PAGE. Isopycnic fractionation in sucrose gradients was performed essentially as described . Briefly, cells (one confluent T162 flask of HT1080 or NIH 3T3 cells expressing different CD98 constructs) were lysed in 2 ml 500 mM sodium carbonate buffer, pH 11, in the presence of protease inhibitors and passed through 25 gauge needle 5 times followed by 6 passages through 27 gauge needle. The homogenate (1 ml) was adjusted to 45% sucrose by addition of 1 ml of 90% sucrose in MBS (25 mM MES, pH6.5, 150 mM NaCl) and placed at the bottom of an ultracentrifuge tube. A 5–35% discontinuous sucrose gradient was formed above (1 ml of 5% sucrose: 2 ml of 35% sucrose, both in MBS containing 250 mM sodium carbonate) and centrifuged at 45 000 rpm for 16–18 hrs in SW 55 Ti rotor (Beckman Instruments, Palo Alto, CA). From the top of each gradient 0.4 ml fractions were collected and analyzed by SDS-PAGE electrophoresis, or adjusted to pH 7.5 (with HCl) and used for immunoprecipitation experiments.